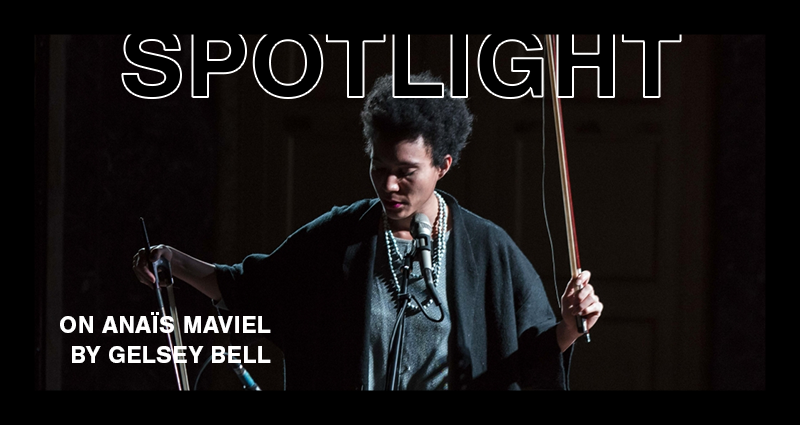 For her first Van Lier Fellowship concert at Roulette, vocalist and composer Anaïs Maviel premieres who is this ritual for and from? featuring collaborations with pianist and composer Sam Yulsman and choreographer Daria Faïn on February 5th. The first time I heard Anaïs Maviel sing still echoes in my memory, infused with a June breeze, her drum beat, and sunshine spilling into a Brooklyn backyard. We were playing on a bill together for one of Mara Mayer’s Home Audio concerts (along with another Roulette favorite Gabrielle Herbst) that Mara had smilingly named Three Sirens. This was back in 2013 before Anaïs moved to New York from France, and her music wrapped into me like a fishing line, a siren song that continues to delight and inspire me. Now after five years in New York City, Anaïs has become an integral part of music and interdisciplinary art-making in the city. Tell us about what you’re planning for your shows in the spring at Roulette. I’ve been thinking about a way I could take the February 5th show as a passage ritual for my solo practice, wrapping together my inside and outside, earthly and cosmic, past and future processes—an occasion for me to assess how my language and ability to relate have developed hand in hand, and to share cohesively intimate and common finds, blurring lines between self and other. What has come up so far is a fluid spiritual and bodily relation with acoustic and vibratory phenomenons I’ve come to approach as healing, as oneness. Some ways to access “otherness,” digging inward, seem to reveal collective stakes in performance, and its function in society. I’m interested in the witnessing experience being performative and the performing experience being meditative. I’m exploring gaps between meditative and cathartic practices, and the mediation of articulate language between these realms, in order to transform shared reality with continued intent through vibration. I’ll try to touch on some of this, as well as the collaborative processes that nurtured these inquiries: With choreographer Daria Faïn—who, alongside Robert Kocik (the Prosodic Body), has helped me realize every sounding body is already moving, that every moving sound contains language—and with pianist and composer Sam Yulsman, whose understanding of the symbolic undercurrents of my music has helped me unfold a compositional language. The piece I’m performing at Roulette in Summer 2019 will be a continuation of my recent collaboration with Swedish visual artist, activist, and instrument-maker Jonatan Malm, with whom I’ve explored the resonances between ancient (trans-generational, diasporic wisdom) and future (immediate, urban cyborg) spaces of sound and their politics. Between music that comes from Northern forest lakes entities and Southern mangrove spirits, there are many conversations to have to address our current globalized ideological crises. We’re looking at this critical human dependency on the environment, and the sacredness of the realm of so-called nature, informing every step of human emancipation and collapse. From there, I dreamed a piece involving several synthesizers and wooden percussion instruments, played by vocalists and multi-instrumentalists—mediators between ancient and future relations to sound in space. This will be a toe-dip into some kind of an opera pointing at different layers of current reality and including my recent work around subconscious song-writing, micro-tonal and multi-modal harmonic systems. We’re also doing a show together! Joined by Amirtha Kidambi and Megan Schubert, we will have a night where each vocalist-composer makes a piece for vocal quartet. Can you tell us a little bit about what you’re planning for that and what you get out of collaborating with other vocalist-composers? It is very exciting for me to get to write for such powerhouses. I’ve been feeling strongly about writing for voice, and I am absolutely thrilled to be involved in such an endeavor. Being part of each of your process as an interpret, at the same time as I write for each of you – what a dream way to be creative with other voices! I feel like it opens up possibilities, in terms of texture, range, and language. I hope I can honor each specific talent of yours and hopefully contribute to a collective expansion. My piece starts from formlessness, soundscapes that fill our ears as we live our lives, that give flavor to each moment we experience, the light buzz and the cat’s walk, the blowing wind and the plane growl. Time shifts that move a sound shape to another, the extraordinary alignment of poly-rhythms between street work, breeze, pedestrian paths, crickets and bird jams, and their amazing harmony. Sometimes these epiphanies happen in long cycles, sometimes they are immediate, and they all speak to me as a language of interdependency between realms. Although some sounds have a certain opacity to my ear because I don’t understand their function, they still have a certain transparency as they intertwine with my reality and impact my way to be present to it. And ultimately, my body forms around these sounds to create language. As far as content, I’m invoking the symbolics of a divine feminine shifting paradigm, the intuitive and practical Pallas-Athena—as other than the old-school sassy Venus. I experience womanhood as a critical point of view on current societal shifts. While these transformations impact society and human evolution as a whole at different paces, I experience their correspondences with interest. Like rivers whose streams are slow and take years to reach the ocean, while other streams are almost ubiquitous. I’m wondering about the role of femininity in this transformation, as I am concerned by the state of our species, our relation to each other across genre, age and culture, and to all forms of life in a strange race to destruction. Your music often involves a mix of singing and drumming. How do those two activities interact in your work and compositional / improvisational process? Do they feed each other? To sing and drum is at the root of my experience as a musician. I believe music, as a form of communication prior to articulate language, is fundamental to human experience. Pre-language in music is really interesting to me, a lot of my research focuses on the gestation process of expression, the alignment of pre-language with post-language music somehow. Music interests me to the extent that it carries the potential to (re)-organize our brains, as a prelude to the way we imprint our imagination onto reality. Voice and drum offer direct access to the intuitive perception of vibration, as a laboratory for sonic alchemy. As a teen, I was lucky to be involved with sacred Shona music (from Zimbabwe); Realizing then that the entrancing function of rhythm in relationship to singing was key for transcendental experiences really hooked me on music for good. In Shona music, when you’ve sung for hours and the air is thick with woven vibrations, the magic of overtones takes hold, and the durational interaction of metallic buzzes and whirling calabash seeds sound like divine voices. Trance is key to bliss, accessing various states of consciousness, and collective transformation—voice and rhythm being its prime triggers. These principles are found in most traditional music which I find fascinating because it comes down to human coexistence transcending cultural differences, through the shared experience of hearing and sonic interaction. Since connecting these dots, I’ve been obsessed with dimensional shifts, when repetition becomes a canvas for more harmonics and polyrhythms to reveal themselves, the ones that are already present on our surroundings and that, as musicians, we excavate or allow to appear—depending on the method. Also, percussion instruments, as well as voices, challenge dominant ideas of pitch. I love the whole percussive tonal world, how it refines the ear to over and undertones and how it impacts the way I sing. One would think a percussion instrument has only a couple notes, but the surdo, singing bowls, bells, and gongs have been for me infinite wells multiplying melodic paths I can explore vocally. Tuning my ear to percussion-impulsed shifting and bending intervals has impacted my harmonic perception, and how I approach rhythm and harmony together. As a composer, I’ve been exploring minimal, cyclical possibilities of drumming as a trigger to multi-modal, polyrhythmic explorations and odd textures combining voice and percussion. Personality splits have also been interesting finds, as the drum has this very conversational quality to it. I experience language shifts when I express myself with drums, or voice, or when both communicate under their own physical terms. All these are related to shamanism, which is inherent to such practice. In what way do you see the place of politics in your work? It is core and shell, although I want to be very careful about my work proving any point. Politics are ethics and aesthetics combined. I believe that as an artist, my function is to catalyze new political thoughts. As a utopian, I mean to open up possibilities for realities ahead. As a love warrior, I intend to deconstruct ideologies and to liberate hearts, minds, and bodies. Gelsey Bell is a New York City-based critically acclaimed singer, songwriter, and scholar. She has released multiple albums, including most recently This is Not a Land of Kings, and Ciphony with John King. She received a 2017 Music/Sound Award from the Foundation for Contemporary Arts, has had work included in PS1’s Greater New York exhibit, and has had both a residency and a commission from Roulette. She is a core member of thingNY, Varispeed, and the Chutneys. Performance highlights include Dave Malloy’s Natasha, Pierre, & the Great Comet of 1812 (on Broadway) and Ghost Quartet, Robert Ashley’s Crash, Matthew Barney and Jonathan Bepler’s River of Fundament, John King’s Micro-Operas, Yasuko Yokoshi’s BELL, Kate Soper’s Here Be Sirens, and Gregory Whitehead’s On the Shore Dimly Seen.